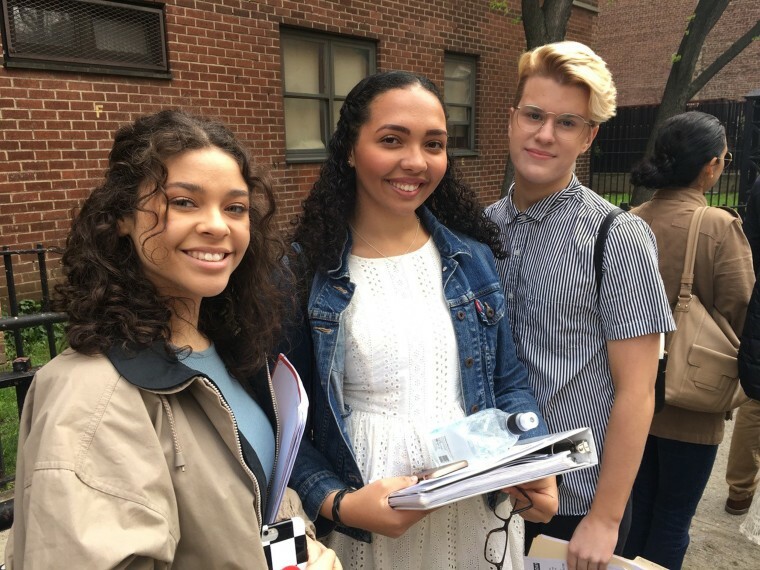 "I am Puerto Rican, and this is huge," said one aspiring actress as she auditioned for the anticipated Spielberg film project. Actors began lining up around 3 a.m. outside the Julia de Burgos Performance and Arts Center in East Harlem, in New York City. By 8 a.m., the line had grown to several hundred, winding down the block and around two corners. Some performers sprawled on the sidewalk amid backpacks and dance bags, while others stood and applied makeup, mouthing the words to their audition songs. Some were with their parents; others seemed to be alone. Steven Spielberg is looking for new faces to star in a remake of West Side Story, and he is hoping to cast Latino actors in lead roles. Spielberg is set to direct the upcoming film, with an adaptation by Pulitzer Prize-winning playwright Tony Kushner. A nationwide talent hunt is currently underway. West Side Story began as a 1957 Broadway musical, with a legendary creative team that included Jerome Robbins, Leonard Bernstein, Stephen Sondheim, and Arthur Laurents. The film version premiered in 1961, and the musical was revived in New York in 1964, 1980 and 2009. Since the remake was announced, the internet has been rife with speculation about which actors might be right for roles, with some performers sharing their audition tapes on social media. A project like West Side Story holds the potential of breakout roles for Latino actors. The audition notice put out by New York City casting director Cindy Tolan noted that “Maria & Anita are Latina” and “Bernardo is Latino,” referring to the top two female roles and one of the top male roles. In addition to the call in New York, an open audition was held in Chicago on April 9, and another call is planned for Orlando on May 5. A representative for Cindy Tolan Casting and Amblin Partners declined an NBC News interview request. The remake of West Side Story comes as Latino advocacy groups have highlighted the lack of Hispanic representation in film and TV. A February study by the University of California Los Angeles showed that Latinos are underrepresented across all areas of the entertainment industry. Latinos accounted for just 2.7 percent of all top movie roles in 2016, and 5-6 percent of roles on television. Felix Sánchez, chairman and co-founder of the National Hispanic Foundation for the Arts is encouraged by the West Side Story remake. “I think this is a huge door opening. Spielberg should be wildly applauded for taking on this project, and we should be supportive of his efforts.” He pointed to Spielberg films like Amistad, The Color Purple, and Schindler’s List as elevating stories to audiences worldwide. While hailed for tackling issues like migration, assimilation, and racial and ethnic prejudice, West Side Story has often relied on non-Latino actors to portray its Puerto Rican characters. The original Broadway cast featured Chita Rivera as Anita, but the lead role of Maria was played by Carol Lawrence, who is of Italian descent. In the 1961 film, Anita was played by Rita Moreno (who won a Best Supporting Actress Oscar), while the lead role of Maria was played by Natalie Wood, of Ukrainian heritage. In West Side Story’s last Broadway revival, producers tried to make the production more authentic by hiring Latino performers (like Karen Olivo, who won a Tony Award), and incorporating Spanish-language lyrics written by Lin-Manuel Miranda. This experiment was not well-received by audiences, and the producers eventually returned most of the lyrics to English. In April, actress Sierra Boggess, who is not Latina, withdrew from a BBC musical special in which she was slated to sing the role of Maria, citing “whitewashing” complaints. By searching for Latino talent, the film remake seems to hope to avoid such issues of authenticity and representation. The author of West Side Story as Cinema: The Making and Impact of an American Masterpiece, Acevedo-Muñoz noted that the original West Side Story was not completely genuine to the Puerto Rican experience. “As someone who was born and raised in Puerto Rico, I can tell you that no one on the island refers to the U.S. as ‘America’ (the title of an iconic song in Act 1). Maybe Estados Unidos, the mainland, or New York, but not America," said Acevedo-Muñoz. "That was a cultural error created by people who did not fully understand what they were writing about.” And the film’s use of “brownface” – even Rita Moreno wore darker makeup in the movie – would be unlikely done today.